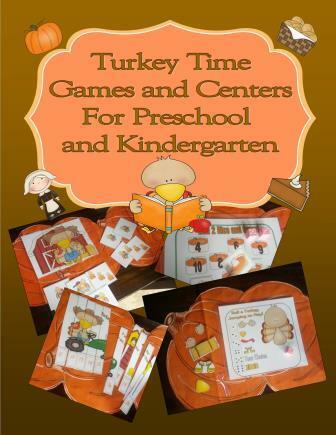 This set includes easy to use games and centers with a Thanksgiving Theme. Laminate each game or center and keep it forever! Great for Kindergarten and Preschool! Pages 5 to 10—Turkey Time Counting and Puzzle Game. Page 13, 14, and 15—Roll a Turkey Dinner Tally and Graph. Includes printable dice. Page 17 and 18—Addition center. Match a problem to the correct Pilgrim. Page 19 through 28—Beginning sound puzzles. Match the turkey to the correct sound. Great take it to your seat center. Page 34 to 39—Letter sound roll, say, keep. Last page includes blank cards that you can program with your desired skill. Page 40 to 46—Turkey Time Bingo—8 different cards and a set of calling cards. Pages 46 to 48—Dice Game—Race and Roll to the pie! Page 49—Roll two dice and cover game. Page 50—Bonus T is for Turkey and Tractor Activity Sheet.